Keith Says: Here is the clearest photo I can find which shows the shoulder patch worn by all inmates of my era. 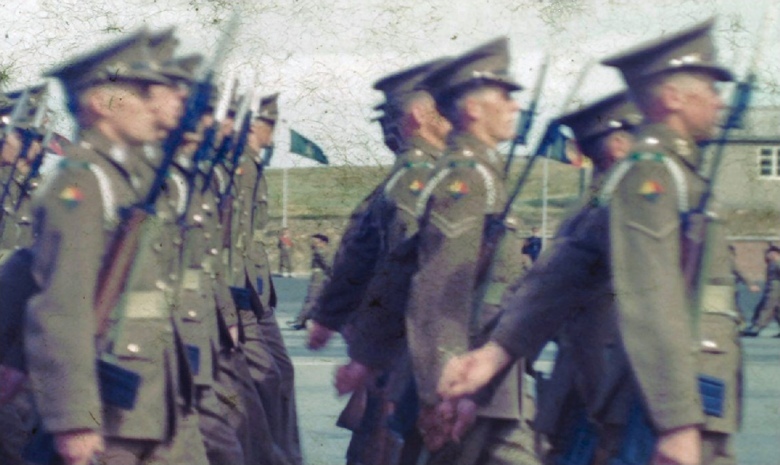 This photo, much scratched, shows some of 'C' Company at the graduation parade in the summer of 1961. In the background are those, in BD, who are graduating. I remember we had to undergo two forms of arms drill, the first with the old lee enfield .303, and then again with the SLR as shown in this photo. The dressing in the photo could be improved but the creases are sharp and at least one 'slashed' hat can be seen. Did anyone else out there have to buy another after taking a razor blade to the ends of the peak and inserting a tooth brush handle behind the cap badge?